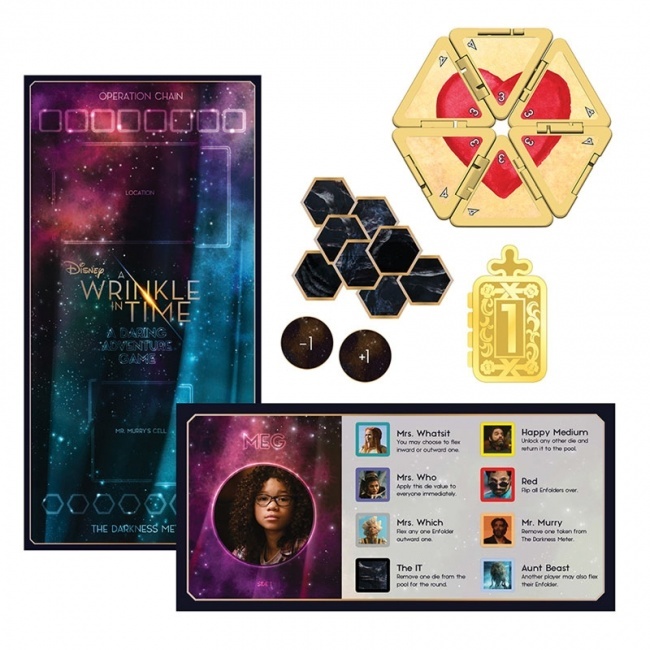 USAopoly is bringing the adventure of Disney�s A Wrinkle in Time movie to the tabletop this March with the cooperative Disney�s A Wrinkle in Time: A Daring Adventure Game. 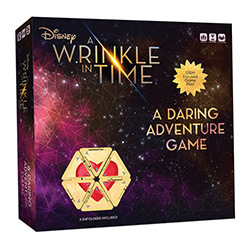 Inspired by the movie and designed to present STEM-focused educational play, Disney�s A Wrinkle in Time: A Daring Adventure Game is a cooperative, puzzle-based board game. The players, acting as the main characters from the film, must work together to decode hidden messages and solve a series of mathematical puzzles with the help of the game�s �flex enfolders� as they try to rescue Mr. Murray. The game includes 1 game board, 3 double-sided player boards, 21 cards, 3 flex enfolders, 8 custom dice, a pair of Mrs. Who�s Quizzing Glasses, and 11 tokens. Disney�s A Wrinkle in Time: A Daring Adventure Game can be played by 1 to 3 players in about 45 minutes, and is intended for ages 8 and up.